Himachal Pradesh is a hidden treasure for adventure enthusiasts, especially for bikers. Himachal Pradesh can help tourists in discovering a little adventurer within them. The joy of experiencing every nook and corner is something way beyond any adventure activity of the world. Whether it's about crossing the deadliest trails of Kinnaur or biking on the smooth roads of Kasauli, travelling here can be really an interesting expedition. On a short tour to Himachal Pradesh, visitors will experience a mesh of deserts, silvery mountains laden with snow and lush fertile farms. Its challenging terrains and scenic beauty keep on calling motor bikers from across the world. 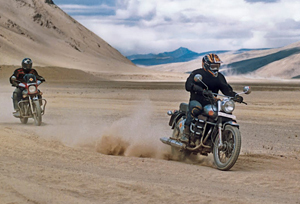 Shimla-Manali-Leh route is the Mecca of every rider's undying spirit. This trip will take tourists to the world highest 'motorable' pass. 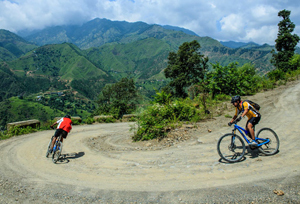 Adventure enthusiast can test their skills and endurance by passing through the roads of Himachal Pradesh. Four paddlers, the trail from Manali to Shimla via spiti valley is simply a heaven. Sarahan, Baspa (Sangla) Valley, Kalpa, Nako, Sumdo, Tabo, Dhankar, Lalung, Gungri, Ki, Kibber, Kunzum Pass and Rohtang Pass are some of the prominent sites paddlers will pass through. Hear the bikes rev up in happiness as they will ride on the beautiful highways of Himachal Pradesh. The roads of Himachal Pradesh are tough to travel owing to their extreme climatic conditions, which are just not meant for faint hearted people. Motorsport in the Himalaya is a challenging activity, thus very experienced riders should drive on the roads of Himachal Pradesh. Hailstorms, thunderstorms, landslide, avalanches, and snow-fall are some of the challenges which tourist can face. It is said that "a thing of beauty is a joy forever." A ride on the roads of Himachal Pradesh will fill the heart of every paddler with satisfaction; this experience will stay in the heart of every explorer. Going for a motorcycling or bicycling trip in Himachal Pradesh can be really exciting, which adventurers must experience and explore.